Doctor: Oh, Mr. Holmes, I would love to tell you, but then, of course, I'd have to kill you. Often heard in settings related to espionage and high security levels, the phrase "I'd tell you, but then I'd have to kill you" is itself probably a Dead Horse Trope by this point - whether for a serious straight use or not. Nowadays used much more tongue in cheek to poke fun at stern security protocols and classification, it has started to show signs of decay since it's hard to pass off a Stock Phrase as an original joke. Instead it's more common to get it as one character's joke to another, perhaps to demonstrate that character's lack of regard to the rigmarole of secrecy or mockery of the other character's clearance/understanding. A common modern comedy subversion is to have one character say the phrase to another with the response "So it's classified?" they then answer "no, I just feel like killing you." Compare Just Between You and Me, in which a Big Bad tells the hero something they shouldn't before they attempt to kill them. See the Supercut Mashup trailer of this line being said a bunch in films . Japanese speakers don't have this Stock Phrase, but people like Heero Yuy skip straight to "omae wo korosu" (literally "I will kill you") when people like Relena Darlian find out too much. Ghost in the Shell: Stand Alone Complex: Solid State Society. Paz says this to a mook in response to his Who Are You?, and clearly enjoys every second of it. Cowboy Bebop episode Stray Dog Strut. Punch uses this line when his co-host Judy asks what a "data dog" is. In the New 52 version of Resurrection Man, Mitch asks a demon what he's planning, and gets the reply "I could tell you that, but then I'd have to kill you. Repeatedly." Bullseye's Greatest Hits was a miniseries where Bullseye is incarcerated after stealing and hiding a batch of plutonium. The NSA sends a pair of agents to interrogate him, and he spends five issues messing with them and telling them conflicting accounts of his life story. One of them finally gets tired of the game and asks him how he hid it. Bullseye: Okay, but you know the drill. If I tell you, I'll have to kill you. Baldry: That would be quite an accomplishment. The Drummer: So what's the plan. Elijah Snow: If I told you, I'd have to kill you. The Drummer: That joke is older than you are. Inverted in Death Vigil: Sam is Dead to Begin With, and Bernie only explains the secrets of the Vigil after Sam takes the offer to be revived. Said almost verbatim in a Dilbert strip. In Tempest of the Fae a goblin operating the mine cart Harry, Hermione and Luna ride in says "If I told you, you'd have to kill me." The stated rationale is that while it isn't technically illegal for them to be in possession of that particular information, offering it freely would count as treason. In Bleeding Clown Harry and Snape communicate via two-way journal over the summer. Harry asks where Snape stays when he's not at Hogwarts. Snape: In one of the Snape family manors, a highly unplottable location. If I told you, I'd have to kill you. Ginny: Can't talk in front of us? Harry: I could, but then I'd have to kill you. It's super-secret stuff. In To Someone Who Is As Fed Up and Bored As I Am Harry asks a Muggle tailor in his neighborhood to make a robe according to a friend's design, claiming that it's for a costume ball. Tailor: So which school do you really go to? Harry: Hogwarts School for the Gifted. A small private school in Scotland. I would love to tell you more, but I would have to shoot you. To Hell and Back (Arrowverse): Barry says exactly this to Caitlin regarding his League of Assassins training. He's really not joking, and even regards the act as a Mercy Kill, knowing that the League would do worse. Maverick: We happened to see a MiG 28 do a 4g negative dive. Maverick: It's classified. I could tell you, but then I'd have to kill you. Paul Allen: Well, Halberstram, I could tell you... but then I'd have to kill ya. Chris Farley's character uses this line on a little boy on a plane in Beverly Hills Ninja and makes the kid cry. A variant in The Long Kiss Goodnight: "If you want me to talk in front of him, you may be asked to kill him later." In the 2009 adaption of The Picture of Dorian Gray, Dorian quips this in response to being asked his secret of looking young. Agent One uses this is Johnny English. When Johnny himself tries it later, he gets the response "I'd like to see you try." Played with in Men in Black: J tells Laura about the MIB. Then says "I'm sorry, I'm gonna have to...", to which Laura responds "Kill me." But just a little flash with the neuralyzer, and everything goes back to the way it was. The phrase appeared in one promotional poster for the hacker thriller Sneakers. In the Hammer Horror film These Are The Damned (1963), government scientist Bernard gives his mistress Freya the quote below. He's not lying either, as he kills Freya at the end of the movie after explaining the project he's working on. Freya: I hate your secrets, Bernard. Bernard: If I were to tell you even a little bit about, what you call my secrets... I might be condemning you to death. Philippa Eilhart: Blessed are those who do not know, for they shall live a while longer. Discworld: Vetinari (then a young assassin) in Night Watch — "I'd tell you but then I'd have to find someone to pay me to kill you." The first title of The Gallagher Girls series is I'd Tell You That I Love You But Then I'd Have to Kill You. Loki says this in American Gods - the Fat Kid naturally assumes he's kidding. When the kid replies that yes, he really does want to know... he tells him. And then he kills him. Dragon: "Were I to tell you matters pertaining to the internal politics of the House of the Dragon I should only weary you. And I would then have to kill you for knowing. So my thought was not to trouble you with such information." From The Three Musketeers, Athos: "Because I am believed to be dead, and have reasons for wishing nobody to know I am living; so that I shall be obliged to kill you to prevent my secret from roaming over the fields." Used in its exact words by Osiris in the last book in The Secrets of the Immortal Nicholas Flamel series. The Honourable Schoolboy by John le Carré - Ricardo explains his monologuing problem to Jerry: "You confuse me, Voltaire. If I tell you too much, I have to shoot you. I'm a very talkative person, you follow me? I get lonely up here, it is my disposition always to be lonely. I like a guy, I talk to him, then I regret myself. I remember my business commitments, follow me?" Paladin of Shadows: Used as a joke by Mike, when asked by a beer distribution company representative how Mike had earned the money he was fronting for the Mountain Tiger Beer brewery. In Foxglove Summer, Peter tells another police officer who asks him the truth about the supernatural "I could tell you, but then you'd have to section me". In Instrument of God the author breaks the fourth wall to tell a story about his relationship with the intelligence community in an indirect way, then actually uses this phrase to explain why he can't be more direct. Star Trek: Deep Space Nine: A scene between Weyoun, Damar, and Damar's lady friend, in the war room. Weyoun: Your friend doesn't want to hear this. Damar: And why doesn't my friend want to hear this? Weyoun: Because if she did I would be forced to have her executed. Weyoun: [somewhat snarkily] What a pleasant woman. Crossing Jordan episode "Out of Sight"
Dr. Nigel Townsend: Counterintelligence for the Royal Navy. I'd tell you more, but then I'd have to kill you. Joe Garrelli: There is a secret word that, when uttered, forces the judge to rule in your favor, then go to a secret location to paddle themselves in a secret ceremony. Dave Nelson: What is it? Joe Garrelli: I'd tell you, but then I'd have to kill you. Dave Nelson: All right, but it better be good. Psych episode "Poker? I Barely Know Her"
Shawn Spencer: Or perhaps you're referring to my license to kill. Revoked — problems at the Kazakhstan border. I'd give you the details, but then I'd have to kill you, which I can't do because my license to kill was revoked. Stargate SG-1 uses a variant where an offhand comment is made about O'Neill's time of service and the possibility of writing a book about it. Due to much of his duty even before joining the SGC consisted of top secret operations, he jokes that he'd have to kill anyone who read it. The Colbert Report is going to the Persian Gulf, but exactly when or where it will be has been sworn to secrecy by the Pentagon. Stephen Colbert: I could tell you, but then they'd have to kill me. In the premiere episode of Band of Brothers, Nixon already knows where the unit is going, and teases Winters with this phrase. Nixon clearly wants to share the information, but Winters refuses to ask, so Nixon just tells him anyway. Alan: What happened to MIs 1, 2, 3 and 4? Stephen Fry: Well it's very interesting, I could tell you, but then I'd have to eat myself. One Alias promotional video spoofs this with Jennifer Garner addressing the audience. Jenny: If we told you more about the show, we'd have to kill you. Secret Service Agent: Who's Mrs. Frederick? In The Sentinel, when Jim and Blair go on a classified mission, Blair goes into a discussion about how police departments indoctrinate their members like a cult—Jim jokingly agrees, and says that, now that he's told Blair about it, he "will be required to kill you." In Merlin, Merlin tries to lampshade this by saying "Right, 'cause if you do you'll have to kill me I suppose," but Arthur responds with "Immediately and without hesitation." On Caprica, a character uses a Tauron phrase that is subtitled as "If I revealed the details, I'd have to return you to the soil." Kate: Steve Adler is your fraternity brother? Tony: I'd show you the secret handshake, but then I'd have to kill you. Played with in one episode of CSI: NY. During the Cold Open Adam is talking to a girl via webcam, using some fictional form of Chat Roulette. He asks her something - can't remember quite what - and she responds with this phrase...at which point the murderer sneaks up behind her and kills her right in front of Adam, kicking off the Mystery of the Week. In Jake 2.0, Jake's younger brother steals Jake's wallet and goes to a bar. A girl notices the NSA ID, so the brother starts pretending to be a spy. He starts saying this phrase, and she finishes it off, annoyed at the cliche. He corrects her that he'd have to sleep with her, "but if that's your thing..."
Buffy the Vampire Slayer: from the episode "Inca Mummy Girl": Xander is involved with Ampata, unaware she's actually the Monster of the Week who's forced to drain Life Energy from people to survive. Xander: Hey, I know why you can't tell me. It's a secret, right? And if you told me, you'd have to kill me. Xander: Oh! That was a bad joke, and the delivery was off, too. I'm sorry. Daisy: Actually, what is your job, Mike? Mike: [sincerely] If I told you that I'd have to kill you. Daisy: What, is it a secret? In one episode of NUMB3RS, Amita is asking Charlie a question about exactly where he learned code phrases (beyond that it was at the NSA) and he replies with the trope. She thinks he's kidding, but he's actually quite serious. In America's Got Talent, after the amazing presentation by quick change artists David and Dania, Brandy Norwood asks David "How do you do that? ", to which an exhausted David replies: "We could tell you, and then we'd have to make you disappear." In Gotham, when Nygma asks Hugo Strange who really runs Indian Hill and Wayne Enterprises, the Psycho Psychologist replies "I could tell you, but then I'd have to lobotomise you." Mariah Dillard: You could at least let Tony bring me. I got lost three times trying to find this damn place. Willis "Diamondback" Stryker: Sure, but then I would've had to put a bullet in the back of his head. No one comes here. Period. The Jamie Foxx Show: An episode revolved around Aunt Helen's pies which were utterly irresistible. Jamie manages to convince her to commission them out to banquet fiction and they meet the quota. But the night before they're to be shipped off, Jamie gives into temptation and ends up eating all of them. Luckily Helen foresaw this and had some backups hidden away to replace the eaten ones. At the end Jamie asks what she puts in the pies to make them so good, to which she replies with this trope. MF DOOM in the song "Superfriends": "I don't think you wanna know, even if you still do, and want me to, I'll tell you, but then I'll have to kill you." "Weird Al" Yankovic's ode to Espionage Tropes, "Party in the CIA": "Burn that microfilm, buddy, will you, / I'd tell you why but then I'd have to kill you." Well, since you ask me for a tale of espionage, treason and people in suits looking out of windows with rain running down them. (The windows I mean, not the suits), it so happens that I could tell you such a story, but then I would have to kill you! Hahahaha! Oh, no, wait. This is a story about how I used to be a spy, so I could tell you, but then I would have to kill you. It's all right, though; I was going to kill you anyway. Paranoia: one suggested variant on "That information is outside your security clearance" is...well, this trope. Occasionally, not only is the information outside your security clearance, the fact that the information is outside your security clearance is outside your security clearance. In the second Gabriel Knight Adventure Game, during the hunting club reunion, if Gabriel asks Von Zell what he is talking about with Klingmann, Von Zell replies "We could tell you, Herr Knight, but then we'd have to kill you." Banjo-Kazooie: Nuts and Bolts: If you pay Bottles the Mole 6,000 musical notes (the highest price for any single item in the game) to tell you the "truth" about the infamous Stop 'n' Swop, he responds with "I could tell you, but then I'd have to kill you, and we can't show that in a game with this rating. Thanks for the notes!" Blair, in Wing Commander IV when he comes aboard the TCS Lexington, uses this line to poke fun at Maniac. In The Elder Scrolls V: Skyrim, when the player character joins the Dark Brotherhood and gains access to their sanctuary, many members are often conversing on their latest assassination contracts. One particular line of dialogue is Nazir saying, "It's all thanks to a special technique I developed. I call it the 'Razor-Winged Butterfly.' I'd teach it to you... but then I'd have to kill you." Used as a Stop Poking Me! line by the Druid of the Talon in Warcraft III. Nia: Poppi, what's your body made of? Poppi: Poppi could tell you, but then Poppi would have to kill you. 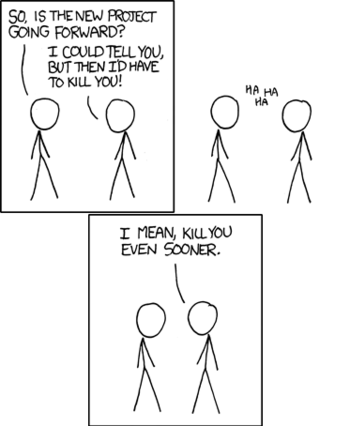 The page image is from an xkcd strip where one character asks another what he's up to and receives the reply "If I told you, I'd have to kill you. I mean, sooner." Combined this with "The Easy Way or the Hard Way" here, when Master Payne gives two Wulfenbach troopers the choice of his being a good magician (who doesn't reveal how a trick is done) or an evil one (who doesn't leave any evidence there was a trick in the first place). In this strip Der Kestle declines to reveal information about Airman Higgs to Zeetha, as doing so would require Zeetha to be killed. Smoke Knight: If we told you, we'd have to let you live. Smoke Knight: For a very, very long time. In one El Goonish Shive strip Justin worries that Mr Verres may have to kill him over things he's already told him. Happened in Schlock Mercenary in a briefing between general Xinchub, some UNS Govt guy dealing with the same secret projects that ran into each others, and a major not cleared for one of them, who was stupid enough to ask a clarifying question which made the issue moot. Naomi: It's not that I have a problem with it. But why do they want that? Ocelot: Welcome to Ocelot Shack. You've got questions, we've got bullets. Played with in a strip from Inside The Gamer's Studio . Whit, the host, is interviewing Vincent Valentine about his role in Advent Children film. Vincent quotes the trope, but Whit says he can live with it. Vincent whispers something in his ear and immediately shoots him dead. A "Retry" screen appears, and Whit starts again from when he asked the question. Combined with The Fourth Wall Will Not Protect You in Skin Horse, Shaenon and Jeff warn the readers that if they reported what Tip and Ginny were actually talking about, they'd have to kill us. Through the screen. Bum Reviews: Chester A. Bum admits that he's Super-Bum. He then says that since he's told you, he'll have to kill you. Good news is he's just joking — he actually makes the viewer impotent. Referenced in Kim Possible. A soldier working on a top secret project blurts out "Neutronalizer" during Wade's briefing. Mr. Dr. Possible asks "This isn't one of those, 'I'd tell you but then I'd have to kill you' sort of things, is it?" The soldier pauses awkwardly and tells everyone to just forget what they heard. In "Big Boogey Adventure", the movie, Billy asks his future self what he is going to have for lunch on Thursday. His future self replies with the trope name. In an earlier episode, Billy asks why Bobby wants his life, to which Bobby replies, "If I told you, then I'd have to destroy you." A confused Billy then asks, "Aren't you going to destroy me anyway?" In the first episode of Godzilla: The Series, Nick says this word for word when Major Hicks asks who hacked right into Con Ed 's satellites, which was the resident Playful Hacker, Randy. In Steven Universe, Amethyst jokingly said this to young Greg Universe when he asks of Rose's whereabouts. Averted by the NSA. Because NSA employees are barred from saying anything about the nature of their work (no matter how mundane), it became vogue, at one point, for them to say this line when friends and family asked. The brass had to put a stop to it because it was overly dramatic and only made people more intrigued.